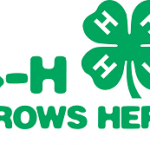 NEW 4-H License Plates available now! Here is another great way to support county and state 4-H programs! The 4-H specialty license plate is now available through the Wisconsin Department of Motor Vehicles. Bearing the message “4-H Empowering Youth”, the plate offers the opportunity to show support of the 4-H program, as well as make a financial contribution. The sale of each license plate will include a monetary contribution to the Wisconsin 4-H Foundation. Half of the proceeds from every plate sale will go back to the county in which the plate was purchased and the other half will be used for state and regional 4-H programs. Counties with license plate sales will receive a disbursement from the Foundation on a yearly basis, with a check payable to the county leader’s association. The funds may be used to support the county 4-H program under the direction of the County Educator. Contact the Wisconsin Department of Transportation directly or visit https://wisconsindot.gov/Documents/formdocs/mv2969.pdf for more information about the process to order the plate. Hello Everyone! I created a survey to better address the needs of the county. I am trying to figure out what types of programs I should be focusing on and what everyone might be interested in. The survey will only take 3 minutes to complete and will determine my focus for the coming future. This is your chance to be heard. Click here for the survey.